Pork Chop hasn't paid a visit to his vet, Dr. Rhee, for a while, so last week Loren and I lured our beloved child into a kitty carrier (well, actually, the only ones big enough at Petco were for dogs) using a couple sprigs of fresh catnip. Pork Chop meowed in panic for the entire car ride, but we eventually realized that he didn't really fear vet visits—he was just annoyed at being trapped inside a small plastic box like a common, dirty Humane Society stray. Once we let him out of the carrier, Pork Chop quieted down and relaxed into his visit. 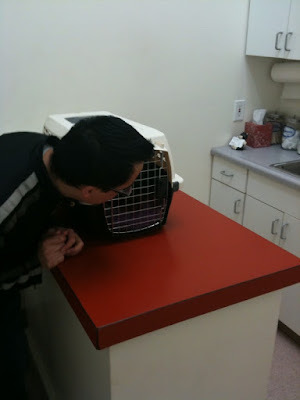 As soon as Dr. Rhee laid eyes on Pork Chop, he exclaimed (in a Korean accent), "That's a huge cat!" He then plopped Pork Chop onto a scale for the moment of truth. Are you ready for this? Brace yourself. Pork Chop now weighs in at a whopping 20.1 pounds! Dr. Rhee's eyes almost popped out. "That's a big cat!" 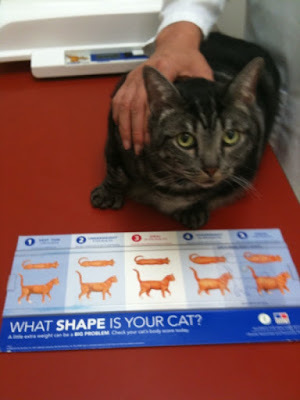 He then showed us a feline weight chart that ranked cat sizes on a scale of 1 to 5. A 1 meant your cat was too damn skinny; a 5 meant your cat was too damn fat. Dr. Rhee slid the plastic bar back and forth across the chart until it landed between the 4 and 5. Pork Chop is definitely more hefty than he should be, but not quite like those morbidly obese people who lay in their beds all day and never leave the house. I mean, you should see how fast Pork Chop runs when we shake a bag of treats. So begins...Pork Chop's 15-Week Weight-Loss Challenge! Dr. Rhee says dry cat food is about 40% water, while wet cat food is about 80% water. The wet cat food has a significantly lower caloric intake, and it also aids in proper hydration. Dr. Rhee says that on this new nutrition plan we want Pork Chop to lose between 5 to 10 percent of his body weight per month until he slims down to an ideal 15 pounds. For the purposes of this new weekly Bamboo Nation feature, Pork Chop's 15-Week Weight-Loss Challenge (appearing every Monday), I'm going to split the difference and aim for Pork Chop losing 7.5% of his body weight per month. Will Pork Chop—Pork Chop!—be able to shave off a significant 5.1 pounds in a mere 15 weeks? He's going to need your encouragement and positive reinforcement! And perhaps some of you will want to join him in this challenge and lose 5.1 pounds yourself in the next 15 weeks!